LIFEGIFT® Launches “School-Zones” to Help Schools Raise Funds and Protect Their Communities from The Dangers of Mobile Phone Related Distracted Driving. Participating Schools Receive 50% of All Revenues Raised. Las Vegas, NV, January 07, 2019 --(PR.com)-- LIFEGIFT® Announces “School-Zones” to Help Schools Raise Funds and Protect Their Communities from The Dangers of Mobile Phone Related Distracted Driving. Participating Schools Receive 50% Of All Revenues Raised. The LifeGift app is the world’s only emotion-based system designed to help prevent car crashes, serious injuries, and fatalities, involving distracted drivers, cyclist, and pedestrians using their mobile phones. “What if we could save lives by preventing distracted driving in our communities, and raise much-needed funds for our schools? With LifeGift School-Zones You Can,” said, Remo Behdasht, LifeGift Creator. According to the National Safety Council, in the United States alone, every year 1.6 million crashes are caused by mobile phone use while driving, and with it close to 400,000 injuries and fatalities. On a global level governments are spending billions of dollars on this epidemic with limited impact. Studies show that peoples FOMO on calls, emails, and all types of instant-messages is greater than a perspective on their own safety. This has a great impact on our communities on a daily basis. LifeGift School-Zones is tool for schools to contribute in making their communities safer, and raise much-needed funds through the 50% of shared revenues program with LifeGift. This is a great alternative to selling chocolates, or cookies which do the opposite of keeping our communities healthy, and safe. 1. Schools simply contact LifeGift at sup@lifegift.com to start the program. They sign the agreement. 2. LifeGift creates a specific referral code for that school with a 1-month free trial. 3. Students then give the referral code to everybody they know via door-to-door or social media, and can be unlimited in number free to share. 4. When people who have used the school’s referral code buy a LifeGift Link Token, LifeGift will allocate 50% of the net revenues to the school. The more people with LifeGift, the safer our roads. With LifeGift on their mobile phones, when they are interacting with their phones during driving, cycling and walking, LifeGift will send an alert in real-time, asking them to think about their safety, and family. The alert includes a custom message from the people they love, including image and custom audio. “We are hitting two birds with the one stone with LifeGift School-Zones: Protecting our communities, and raising funds for our schools. LifeGift is the world’s only distracted driver and pedestrian alert system to use the emotion we feel for our families, and friends as motivation to bring driver focus back to the road, and pedestrian awareness to their surroundings. Looking up one second earlier could make all the difference in getting some safely, or not at all. I strongly believe we will save lives,” continued Behdasht. 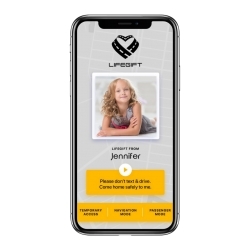 LifeGift has patent-pending technology which runs quietly on the smartphone background and only sends alerts if a driver or pedestrian interacts with their phone. LifeGift is not yet another, “big brother” app that follows the driver or pedestrian’s every move. LifeGift sends alerts in real-time from those we love. LifeGift is available for Apple iPhone and Android smartphone devices for a yearly subscription of only US$4.99 or less. LifeGift will be exhibiting at the CES Eureka Park Hong Kong Pavilion Booth 52922.